With its unique blend of European and North American culture, Québec City belongs on every discerning traveler’s destination list. Founded in 1608 by Samuel de Champlain, cradle of French civilization in North America, fortified city with a European feel, World Heritage Site, port city, and capital of the province of Québec: we wear each of our many identities with pride and we are renowned for our joie de vivre. Québec City is built atop the Cap Diamant cliff making it a two-level city referred to as Upper and Lower Town by the locals. Québec City is also a seaport city where cruise ships dock right in the city centre, steps away from the historic district. The 10th Annual SNL Meeting will be held at the Québec City Convention Centre, which is strategically located on Parliament Hill in the heart of the Upper city, just steps away from Old Québec, the ramparts, and the Plains of Abraham. Attendees will be thrilled to discover a wealth of shops, boutiques, restaurants, and night spots—all within walking distance. 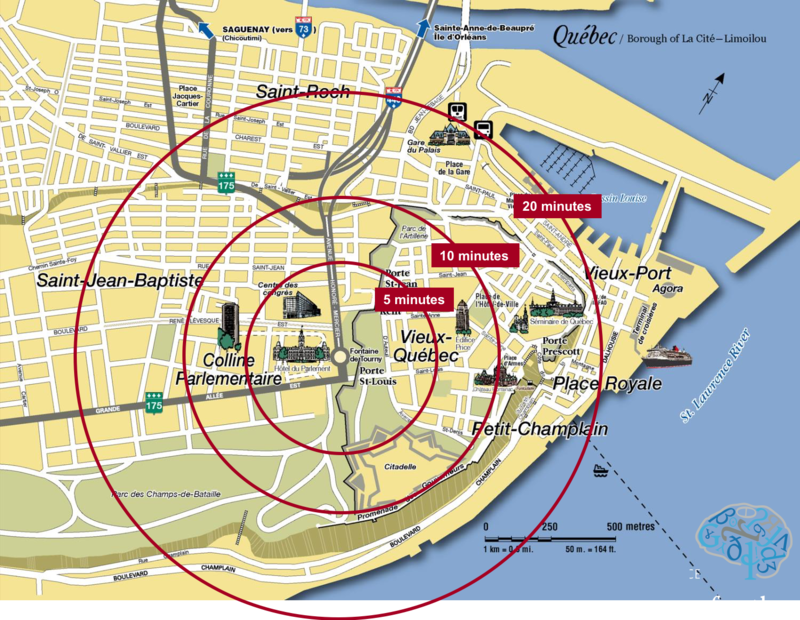 Note, in the figure below, the small black line that represents the Fortifications of Québec City and the location of important icons like the Parliament building and the Convention Centre. The red circles indicate the distances from the Convention Centre. North America’s most European city, historic Québec brims with museums and heritage attractions on virtually every street corner! Proudly conserved and restored, they beckon you back in time to explore the origins of the city known as the cradle of French North America. All attractions and services are within a 20-minute walk from each other.